Looking for High Performing, Loyal Talent? We'll help you find and hire veterans who will help you succeed. You want people with these very qualities, but you want people who can be quickly productive on the job. Our predictive analytics talent engagement approach helps you identify and hire people with the highest likelihood of success in a specific job. Predictive analytics (or aptitude based hiring) has has been shown to be 4-5 times more predictive of job success than traditional methods, i.e. a resume and structured interview. When paired with skills training, motivated, high-aptitude people quickly become not just productive but likely top performers. Returning service members know how to learn and most are highly are motivated. Let us help you find and harness each veteran's hidden potential and help your business thrive! 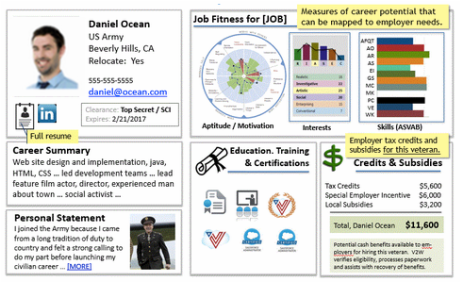 Each veteran in our talent pool has a Career Success Profile that uniquely includes a "windshield" view to complement the usual "rear-view mirror" information e.g., resume). The veteran's Success Profile provides employers with solid data for investing in high potential raw talent and best use of training. Through our partner, Clearfit(tm) employers have 900 generic "Ideal Candidate Profiles" against which to compare a given candidate's job suitability. Find and hire the perfect veteran, directly or with our professional recruiters, from our enriched veteran candidate database or through our nationwide veteran sourcing network. Fill a temporary position with a fully qualified veteran, or "test drive" unproven candidates prior to hire. Contracted veterans are on Veterans2Work payroll as W-2 employees. When it comes to "pre-experienced" employees, like younger veterans, smart employers invest in potential. The veteran's Career Success Profile shows you how well that candidate measures up to the attributes that drive success for that job--and then helps you realize that potential. I want to be Vet-Strong!